Imagine Wisconsin about 500 million years ago. Located near the equator, the area was a tropical paradise, full of barrier islands, lagoons and sandy, shallow embayments, similar to the coast of Florida today. Giant jellyfish cruised the warm waters. This environment, says Whitey Hagadorn of the California Institute of Technology, was the perfect setting for some large jellyfish to leave their legacy. He says the Cambrian sediment trapped hordes of jellyfish, some up to a meter across, preserving their shape and form. In the February issue of Geology, Hagadorn, Robert Dott and Dan Damrow describe how they think these jellyfish remained so well preserved on Wisconsin's Upper Cambrian shoreline. "These are the largest jellyfish in the fossil record and it's one of only two jellyfish deposits in the entire fossil record which is rather ironic because they're both upper Cambrian in age," Hagadorn says. The other fossil site is in New Brunswick. What makes these fossils unusual, Hagadorn excitedly explains, is both their size and abundance, as well as their exceptional preservation in a medium- to coarse-grained sand. "You never get soft bodied preservation in that kind of coarse grain size" in the Cambrian, he says. 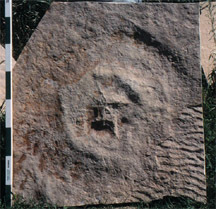 A fossil slab from Upper Cambrian Mount Simon-Wonewoc Sandstone in central Wisconsin, believed to be the impression of a jellyfish. Each scale bar is 10 centimenters (4 inches). Courtesy of Whitey Hagadorn. Hagadorn and his colleagues looked at present-day shores to help them identify the factors that led to the exceptional preservation of these fossils. Firstly, Hagadorn says, in the Upper Cambrian, few scavengers were around eating the jellyfish carcasses. "If jellyfish are washed up on the beach today, they are very likely going to be scavenged by terrestrial organisms." Similarly, few animals were turning up sediments. "Think about going to a modern beach today and seeing sand crabs burrowing through the sand at the shoreline." And lastly, Hagadorn says, the jellyfish had to have remained underneath a large volume of sediment. Jellyfish could swim into the sandy embayments to migrate, prey on other organisms or reproduce. And, a strong storm event could have then trapped the jellyfish. Hagadorn and his colleagues found at least seven different layers of jellyfish fossils over a couple of meters of sediment. Because there is no unconformity between the layers, Hagadorn says, the stranding events could represent a period of time anywhere from one season to a hundred thousand years. Hagadorn hopes to learn more about the Cambrian marine community, and to better understand how soft-bodied organisms fossilize. "When people find a T-rex, that doesn't excite me that much, because a T-rex has bones and teeth --really easy to fossilize," Hagadorn says. "But to preserve a jellyfish, that's hard, because it has no hard parts. Something is there we don't understand." The Upper Cambrian Mount Simon-Wonewoc Sandstone in central Wisconsin is well-known for the preservation of the tire-track-sized trails Climactichnites. About four years ago, Damrow, a commercial fossil dealer, was collecting these trace fossils and decided to send Hagadorn some photographs from the fossil deposit. Several of the photographs had large disc-shaped structures on them that looked like medusae impressions. And that piqued Hagadorn's curiosity. At that point, Hagadorn says, they could not idenitfy the fossils. "You can get a lot of disc-shaped structures produced by other processes. There are a million ways to produce a round mark on a rock," he says. But after meeting up with Bob Dott in Wisconsin and analyzing the fossils at the site and at Caltech, they concluded the fossils were indeed medusae, or jellyfish. "There's just no other way to produce these structures unless you have a soft-bodied spheroidal bag, or jellyfish stranded on a shoreline." But, some paleontologists remain skeptical. Simon Conway Morris, a paleontologist at the University of Cambridge who studies the Cambrian explosion, says that while the fossils look like jellyfish, other possibilities remain, including a connection to the Climactichnites, which he describes as "extremely spectacular trace fossils made by something akin to a gigantic slug." The fossils, he says, could even be some sort of egg case. That possibility is unlikely, Morris says, but everything related to the fossils is still speculative. The authors address the possible Climactichnites connection in their paper, however, "their explanation is as good as anybody can manage at the moment. It's a very sort of curious find," Morris says. "As exciting as the results are, they do actually pose additional questions which are clearly going to open new lines of inquiry." And that Morris says, is what science is all about.